As you may know many alcoholic beverages especially wines and beers tend to go well with dishes that contain meat like steaks, burgers or fish fillets. However, there are healthy vegan dishes that go well with beer and wine if paired well together. Generally, these dishes are rich in flavor and spices so pair nicely with light ales that complement the flavors in the dish by accenting them. An excellent vegan dish you can serve with beer is vegan thai curry with a light citrus ale. Add sesame oil to a frying pan and fry tofu in the pan on medium low heat. Allow to get golden brown around the edges. Lightly salt, a few pinches should suffice. In a separate saucepan, add coconut milk and bring to a boil. Mix in green curry paste and put on medium low heat. Add carrots, snow peas, shiitake mushrooms and red bell peppers. Allow to gently cook on low heat for about 15 – 20 minutes. You want the veggies to cook while also allowing their juices to blend nicely with the flavoring of the coconut milk and green curry paste. Add the tofu about 5 minutes before you decide to take it off of the stove. Follow the directions on the package for the basmati rice which takes about 20 – 25 minutes to cook. You can make the rice while the curry simmers. 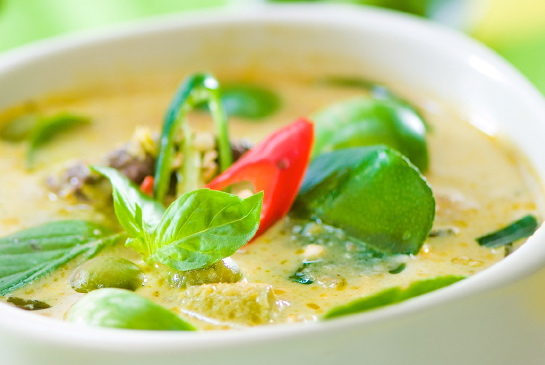 Add the rice to a bowl and serve the green thai curry over your rice. Sprinkle some fresh mint leaves on top as garnish. Pair with a light ale beer with citrus like Dog Fish Head Namaste White ale.